E.T. 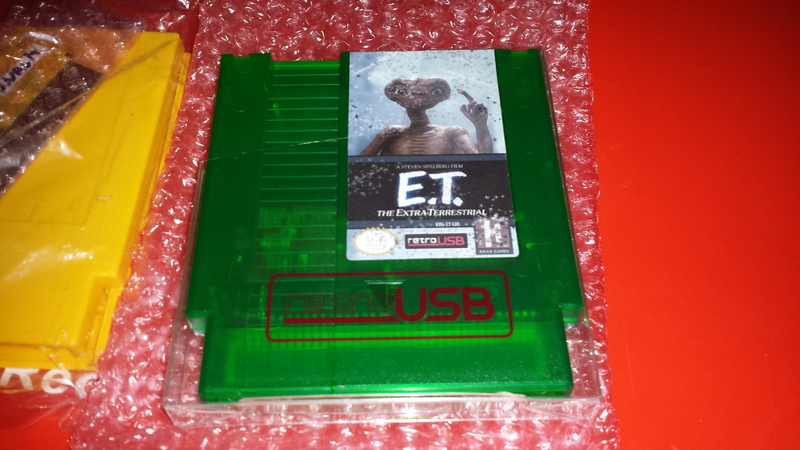 The Extra-Terrestrial (NES) KHAN Games recent release - Now with Box and Manual! This little guy arrived today, surprised no one else posted this yet. If you're curious how I got this, inside of the CIB version of "Larry" was a order-by-mail form for ET. Brought me right back to the 80s Thank you Kevin! I'm not sure if Kevin is still taking orders this way (so I watermarked it), but I wanted everyone to see the form, such a fun and creative way to offer these out! Woah! I Didn't hear about this. But I really want one now. Is it possible for me to do a mail order? If not, is it still being included with the current Larry release? I'm going to be so disappointed if I missed out on this for good. Got Frogger for Christmas and my amphibian friend jumped out of the box and road with E.T. instead. Ah damn! I haven't opened my Larry yet so I didn't see this shizz! I didn't want to be the first one to post it! ANother quality release from K-han and retro USB. My Favorite part is how the label looks like the cart was dug up. How am I suppsosed to get a copy if Larry is still sold out? My Biggest Fear is...She Sells my Games for the Amount I told her I paid for them. Same here. I wasn't ready to order since it was Christmas time and I haven't seen it open since then. I think Brian is trying to catch up because my copy of Xmas 2014 cart hasn't shipped and I ordered that about a month ago. Help me complete my N64 set! Are you going to offer an equally filthy box? Yes, order forms will continue to be included with all future copies of Larry, and will be accepted through the mail until I get tired of handling them. Waiting for my copy to arrive! This was only barely mentioned in one thread when Larry came out. Congrats to everyone that opened their copies of Larry! My best friend's sister's boyfriend's brother's girlfriend heard from this guy who knows this kid who's going with the girl who saw Ferris pass out at the Let's Play Gaming Expo last night. I guess it's pretty serious. Oh, my WTB thread is very popular. The sportos, the motorheads, geeks, sluts, bloods, wastoids, dweebies, Richard craniums - they all adore it. They think it's a righteous thread. I'd also like to add that I've got my father's gun and a *scorching* price guide for aftermarket Nintendo games. Between Dragon Warriors and nothing... I'll take Dragon Warriors - for any of my FT/FS/FO items. I wouldn't have heard about this either but I follow KHAN Games on Facebook and it was mentioned there twice. There was a post on 9/5 and then another on 11/25. As a matter of fact, I wasn't even going to order Larry since Kevin gave me one for helping him with the manuals on the LEs, but when I saw that post in Novemeber I quickly went over to RetroUSB and bought a second copy of Larry! As long as you're ok with it Kev! Make sure you look closely inside the box. One guy swore he didn't have an order form until he realized it was facing backwards and was camouflaged inside the box. Any idea when Larry will be for sale again? dannyplante: I'll be happy to send you a copy of the order form. Just send me your email address. RPGCollector: As far as I know we're still waiting on boxes and manuals from UncleTusk. These look awesome...I love the colored shells on these! Totally wasn't expecting to see it in the mailbox last night. Fantastic! Got it last night. I plan on phoning home after work. Woah I also didnt know about this. Is this only available via Mail-order? Wow, consider me intrigued and interested. Yes, sir! It's a mail-based ordering system. I'm bringing it back to the old school!